The AmScope M149C-PB10-WM monocular compound microscope has 10x widefield and 25x widefield eyepieces, a forward-facing nosepiece with three DIN achromatic objectives, LED illumination, a 0.65 NA single-lens condenser, a plain stage, and a heavy-duty metal frame. The forward-facing revolving nosepiece has 4x, 10x, and 40x DIN achromatic full-glass objectives that provide high-resolution color-corrected images. The monocular viewing head holds the WF10x or WF25x eyepiece on a fixed 45-degree vertical inclination to reduce eye and neck strain and has 360-degree rotation capability to provide a more comprehensive view and enable sharing. A compound microscope is used for inspection and dissection of specimens when two-dimensional images are desired. The microscope has lower (diascopic) Brightfield illumination that transmits light up through the specimen for enhanced visibility of translucent and transparent objects. Brightfield (BF) illumination allows the specimen to absorb light, resulting in a dark image on a light background. LED illumination provides bright, cool light for working with temperature-sensitive or live specimens. The 0.65 NA single-lens condenser and disc diaphragm control the amount of light illuminating the specimen. The plain stage is 3-1/2 x 3-1/2 inches and has an opening for light transmission and stage clips to secure the slide or specimen in place while viewing. A stage stop prevents the stage or specimen from coming into contact with the objectives. Coaxial coarse focus eases use for young viewers. All mechanical components are constructed of metal for precision and durability, and the heavy-duty solid-metal frame has a stain-resistant enamel finish. The microscope is powered by a 110VAC adapter (included) or three AA batteries (sold separately). 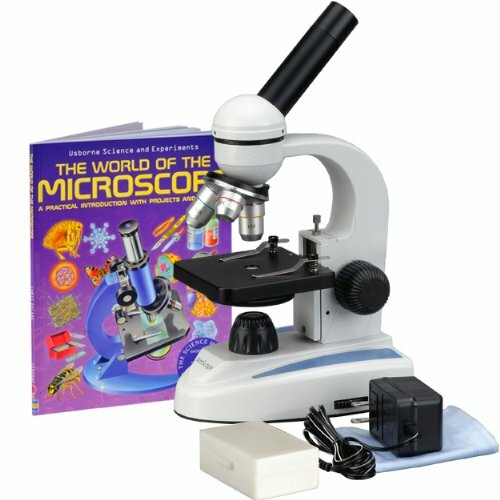 The microscope comes with five blank slides, five prepared slides, and The World of the Microscope book.